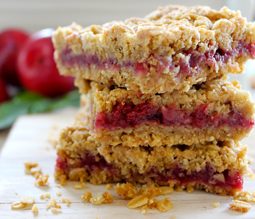 Clif Cobbler Bars - A recipe from Savor California, the online showcase for extraordinary gourmet foods and beverages from California. Recipe by Executive Chef John McConnell. Line a 9×9 pan with foil and spray with pan spray. In a food processor, chop almonds coarsely. Add in flour, brown sugar, baking soda and salt. Pulse mix. Add in rolled oats on the top of the mix. While continuously pulsing the mix, stream in melted butter, beaten egg and vanilla. Pulse mixture just until it comes together, the oats should still be mostly whole and intact. Place half the mixture in the sprayed, foil-lined pan and push down to ensure every inch of the pan is covered with crumble. Evenly spread the entire container of Clif Family Kitchen Fruit Preserves over the bottom layer of mixture. Crumble second half of the mixture over the jam. Cool completely before removing from foil and cutting. Makes 24, 2 inch squares.